The Town Clerk’s office is the repository for official Town records which date back to 1883. I am pleased to assist you with dog licenses, hunting & fishing licenses, marriage licenses, birth, marriage and death transcripts, genealogical searches, handicap parking permits, FOIL requests, voter registration forms, absentee ballots and notary services. Applications can be processed after the submission of the required forms. The Freedom of Information Law pertains to the public’s right to government records. You may have access to information by review or copies. Copies are $.25 per page letter size, $.50 per page legal size and $1.00 per page map size 8 1/2 x 14. 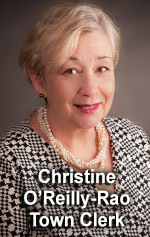 Detailed information can be found on the following website: http://www.dos.state.ny.us/coog/foil2.html. on service hours, making appointments, new applications, renewals, fees, photos and what to bring. A passport facility is located at the Pleasant Valley Post Office, 1612 Main Street (Rte.44) 845-635-8932 and at the office of the Dutchess County Clerk, 22 Market Street, Poughkeepsie, NY 845-486-2120. Customers can visit the U.S. Department of State web site at travel.state.gov for information, downloadable application forms, fees and current requirements. Travel information pertinent to passport regulations and consular information is also available at the site. Download forms for voter registration and absentee ballots by logging onto the Dutchess County Board of Elections website: http://www.dutchesselections.com/ or by calling 1-800-FOR-VOTE. This easy to dial 2-1-1 number is a free and confidential helpline that easily links people to the services they need. Available 24 hours a day, seven days a week, people can call about everything from basic needs like food, clothing and shelter, to volunteer opportunities, legal services, drug treatment, employment support, childcare, eldercare and more. Application for a hawking and peddling license shall be submitted in writing along with any supporting documentation. 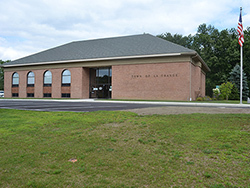 Upon Town Board approval of the application and receipt of the required fee, the Clerk's office will issue the license which is valid for one (1) year. Every dog, regardless of age, owned or harbored in New York State for longer than 30 days must be licensed in the town, city or village where the dog is being harbored. Hunting and Fishing licenses can be purchased at the Town Clerk’s Office. Cash or check, payable to the Town of LaGrange. Do not heat laminate your license panels as the heat will turn the entire panel pitch black. Birth Certificates – must be on file for at least 75 years and the person whose name on the birth certificate must be known to be deceased. Death Certificates – must be on file for at least 50 years. Marriage Certificates – must be on file for at least 50 years and the bride and groom are both known to be deceased. Proof of their relationship to the person whose record they are requesting. Proof of the death of the person whose birth certificate they are requesting. Proof of the death of the bride and groom whose marriage certificate they are requesting. The standard fee for a genealogy copy is $22.00 and applies separately for each record requested. Send the completed form, along with a check for the appropriate amount, made payable to “Town of LaGrange”, to the address below. A couple who intends to be married in New York State must apply in person for a Marriage License to any Town or City Clerk in the State. The Marriage can take place anywhere within New York State. Your marriage license is not valid outside of New York State. The application for a license must be signed by both of the applicants in the presence of the Town or City clerk. No premarital examination or blood test is required to obtain a Marriage License in New York State. There is a 24 hour waiting period during which the ceremony cannot take place. When both of the applicants are over the age of 16, the 24-hour waiting period may be waived by an order of a Justice of the Supreme Court or a Judge of the County Court of the County in which either party resides. If either person is under the age of 16, the order must be from the Family Court judge of the County in which the person under 16 years of age resides. A marriage license is valid for 60 days, beginning the day after it is issued. The expiration date for active duty members of the Armed Forces can be extended to 180 days. There is a fee of $40.00. Cash or check is accepted. Appointments may be made with the Clerk to apply for a Marriage License after normal business hours. Both of the applicants are required to show proof of any previous divorces. The divorce paperwork must be an original or certified copy and contain the “Judgment of Divorce” section. A certified copy of the death certificate is required when a former spouse is deceased. The bride, groom, legal representative or anyone who can demonstrate a legal claim can obtain a certified copy. Those requesting the record for a legal claim will not physically possess the record. The record will be sent directly from the Town Clerk’s Office to the agency requiring the record. If the applicant is not the bride or groom, a judicial or other proper purpose must be documented. An example of a judicial or other proper purpose would be a marriage record needed by the applicant to claim a benefit. Documentation would consist of an official letter from the agency verifying that to process the claim they require from the applicant a copy of the requested marriage record. Applicants will need to fill out the DOH-301 (Application to Town Clerk for Copy of Marriage Record). Current government issued photo ID is required. Copies are $10.00, and can be paid by cash or check. Checks should be made payable to Town of LaGrange. When applying for as copy by mail, the applicant should include a written notarized request along with the application form. Public Health Law 4101 Charges the local Registrar with the enforcement of complete and accurate vital statistics registration. Therefore, before a home birth is registered, the local registrar must determine when, where and to whom the child was born. Parents will be asked to provide positive identification, proof of residency, and supporting documentation from a prenatal or postnatal health care provider, the Department of Social Services or other government agency familiar with the family and the mother’s pregnancy. The local registrar may require that the parents and child personally appear at the registrar’s office. In the case that the mother is not married, the putative father’s name may be entered on the birth certificate only if he and the mother submit a correctly executed Acknowledgement of Paternity (DOH-3732/DSS-4418). In accordance with Public Health Law 4130(2), a Certificate of Live Birth is to be filed with the local Registrar within five days of the date of birth. If more than one year has elapsed since the birth of the child, the registrar will process the birth as a “Delayed Birth”. To the parents of the person named on the birth certificate. To the lawful representative of the person named or the parents of the person named on the birth certificate. To a municipal, state or federal agency when needed for official purposes. To a person who can demonstrate the record is required for a Judicial or other proper purpose. If requested by mail, the applicant should also write a brief request for the copy with a notarized signature. Those falling into categories 1, 4 or 5 will not physically possess the record. The record will be sent from the Town Clerk’s Office directly to the agency requiring the record. Applicant will fill out the DOH-294A (Application to Local Registrar for Copy of Death Record). For records of deaths that occurred after 1/1/1988, the applicant will need to specify whether he or she is requesting the copies with or without the confidential cause of death. 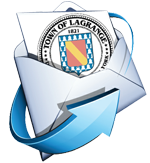 If you wish to hold an event in the Town of LaGrange please submit an application to the Clerk's Office and allow five (5) business days for review. The maximum duration for a temporary permit is 6 months. This permit will also be issued to any visitors from another country who are disabled and traveling in New York State. Permanent Permits are issued only to applicants diagnosed as a “severely disabled person” and have proper documentation stating such. Applicants can obtain the standard “Application for a Parking Permit or License Plates, for Persons with Severe Disabilities” form (MV-664.1) from the Clerk’s office or download the application here. The applicant can fill out Part 1. The address should be a physical address, not a P.O. BOX. The doctor needs to fill out Part 2 completely. Part 3 will be filled out by the Town Clerk or Deputy Town Clerk. Prior to the expiration of your current permit, you should make arrangements for the renewal of your permit. The procedure for renewing a Handicapped Parking Permit is the same as the procedure followed for the original permit. New York State Vehicle and Traffic Law authorizes issuing agents to deny an applicant a permit or to revoke an issued permit if he or she feels there is evidence of abuse. If a permit holder is notified that the permit has been revoked, he or she must return the permit to the issuing agent. If the permit is not returned by the specified date, local law enforcement personnel will be contacted to confiscate the permit.